Albe Pavo is an Italian publishing company created by a group of three friends. Right now on Kickstarter is their newest project - 2nd edition of Carnival Zombie. Their official site states that the mission of Albe Pavo is to create and produce boardgames that are designed to be new and ambitious. I decided to ask a few questions to the creators of games such as Winter Tales and Carnival Zombie – Matteo Santus, Jocularis and Achille Crosignani. Tomasz Waldowski: Thank you for finding some time to answer a couple of my question. 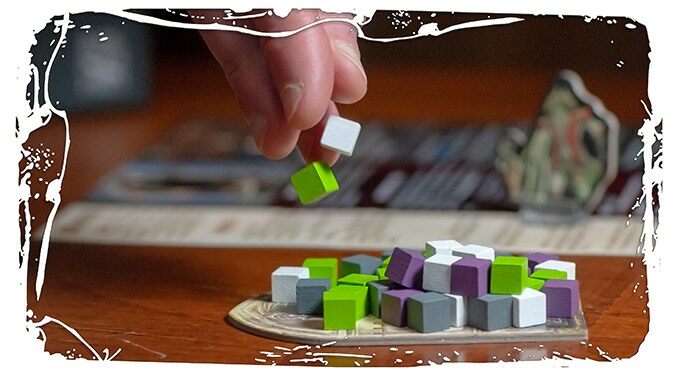 Do you remember when did you for the first time become interested in board games? Matteo Santus: I think I started playing boardgames with Risk. At that time I only know the existence of very few mass-market boardgames and I couldn’t think there were others. Then I discovered a copy of Fief, published the year I was born and I knew there were others. Some time later Hero Quest, Star Quest and Battlemaster were released in Italy and I got them all and played them a lot with my friends. That was the time that I completely fell in love with boardgames. TW: When did you for the first time think about designing board games? How did you get such an idea? MS: I started for fun when i was very young at primary school. Then, growing up, i developed a long experience in historical boardgame and played a lot in an historical group, winning some tournaments also. I always loved history and graduated in history at University, so i started improving historical wargame design to make them more efficient in terms of gaming experience: not falling into the madness of over-detailing, but trying to streamline the most important concept of historical wargame. In the meanwhile i managed also a group of live RPG and both this experience pushed me to designing new mechanics and from then on new games. I did that with a group of friends, but suddenly one of us fell to a terrible illness and so we decide together to gave birth to Albe Pavo in his honor and remebrance. TW: What do you want to achieve by designing a new game? What is your goal? MS: Personally i try always to explore new themes and develop mechanics accordingly. Jocularis: I look for new ways of portraing the boardgames. I like a disrupting approach to the graphic and i’m always looking for a cultural enrichment. Achille Crosignani: The most interesting part to me is the social interaction that boardgames give, so i’m interested in developing games that promote social interaction. MS: I don’t know, the world is full of inspiration and they come from everywhere: history, art, science, culture, books, movies, games... I tell you that I try to take always with me a small notebook, on which i write inspiration and ideas as they come to me. We always try of course to use the background of our Country, that is often rich in many interesting things, for example the Venice Carnival! J: We generally use the theme for creating some game mechanics, we let the atmosphere of the game inspire us. That's why our games are so thematic. And of course we would like to explore new ideas and new way on developing game design. AC: I agree with what Matteo says: I use voice recordings as a way to keep my thoughts alive. TW: You've decided to release the second edition of Carnival Zombie. What can you say about it? What will stand out from the previous version? MS: Since we sold out the 1st edition 3 months after its release, we immediately started working on the 2nd edition to improve it. Then we started talking to big publishers about a co-production for the 2nd Edition. After long reviews, we decided to wait no more and choose to ask the support of the community by starting a KICKSTARTER campaing. If you ask me what stand out from the previous version: almost everything. The game has been improved in so many ways and so many new contents have been added that it is nearly a full new game and much richer. And if stretch goals continue tob be unlocked, it will be always better! TW: So... Is there a possibility to upgrade the first edition to the second edition or are there too many diffrences between them? MS: Yes of course, we will never forget people owning the 1st edition! Since the beginning of the campaign will be available a “1st Edition upgrade pack”, people owning 1st edition could buy this to avoid been outdated by the new release. 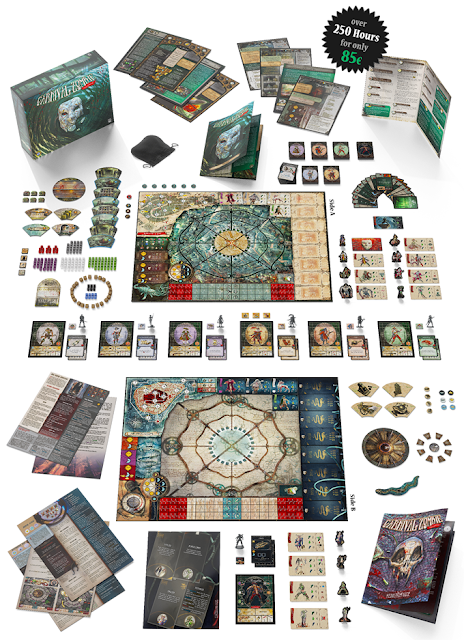 We reasoned a lot about giving it as a physical reward or a P&P and finally choose the second because the game changed so much from the 1st edition, that a physical upgrade pack should have include almost 90% of contents, thus for a 90% price. This solution was not feasible for 1st edition owner looking for a cheap upgrade. So we decided for the P&P version that gives both option: if a 1st edition owner looks for a cheap upgrade, he’ll go for a P&P upgrade, otherwise he will go for the brand new 2nd edition, maybe selling the 1st Edition he owns. You know i saw the 1st edition sold for crazy prices on the web? Up to 300 USD!!! TW: I am a big miniatures fan. 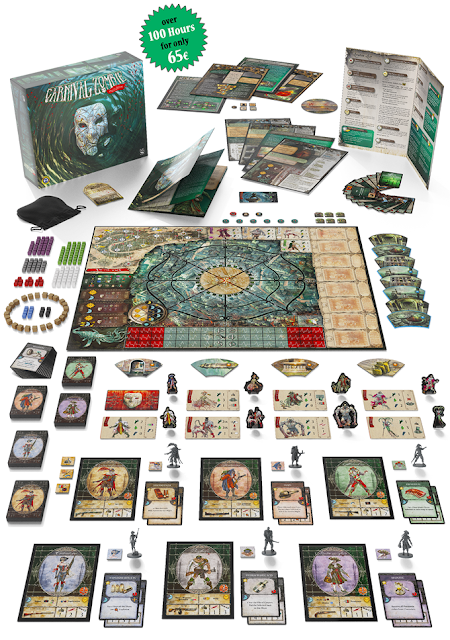 During one game of Carnival Zombie I've said to my wife: if there will be miniatures based on this game then I would buy them without hesitation. And here they are! Who is responsible for these beatiful sculptures and more important question – will there be minis for bosses? AC: They’ve all been unlocked, so the box will include them also! At first we hired professionals for developing the miniatures, but then we’ve chosen to do them by ourself! TW: Is there something extraordinary in Carnival Zombie that you are especially proud of? 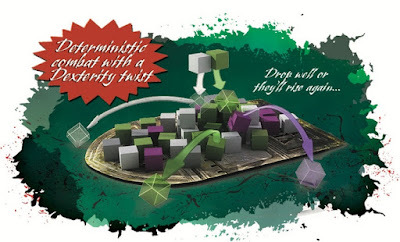 MS: The thing I like the most in Carnival Zombie is that you’re really scarred of those little cubes. I always take a look at people playing the first time: when a full set of zombies swarm in at the beginning of the second hour they go crazy, you could never imagine little cubes being so scary!!! J: Personally, I really like the Pile of Corpse mechanic. I think that this kind of hybrid design could give to the market a lot of new fresh air. AC: All elements in Carnival Zombie are deeply connected one another, there is a huge emphasis on the theme and a cultural stratification: horror movies, history, art, our country, all deeply connected in this game. TW: I really enjoy the artwork in all of your games. Jocularis please tell me what is your role in game development? J: I help developing game development mostly during playtests and giving ideas to work upon. Ideas come to me from my pratical experience of the different artistical areas in which i work. TW: Is there a place or website where we can admire your works? TW: What is you favorite work which you have created? The one you are the most proud of? J: It is the new CARNIVAL ZOMBIE cover art absolutely. In this project we developed a great sinergy: Achille works on 3D and i work on the artworks, together we can make really great jobs! TW: I assume you play other board games. Do you have a favorite title? MS: I cannot say to have a favorite boardgame, because I like to play most of them. I’m not a big fan of standard german boardgames of worker placement and so on because I found them often too boring and too few interactive, but I play everything. I usually love historical boardgames/wargames. Beside Hero Quest in my youth, the games that I played the most I think are Twilight Struggle, Descent and Blood Rage. The game i love the most actually is Evolution, but i really like also Space Alert. J: I play a lot of games, it is important to have a good sight on the market and on succesful products. I usually tend to prefere Boardgames with a strong thematic impact. Some of my all time favorites: Robinson Crusoe, Near and Far, Sheriff of Nottingham, Legends of Andor, Dixit, War of the Ring. The artworks should bring you by hand in the mood of the game, giving you clues about the lore and the specific quality of the concept design. AC: I play almost everything, but i love Hnefatafl and Raptor most of all! TW: Do you have other things planned for Kickstarter backers? MS: Beside stretch goals you mean? Of course we have a great news to reveal. 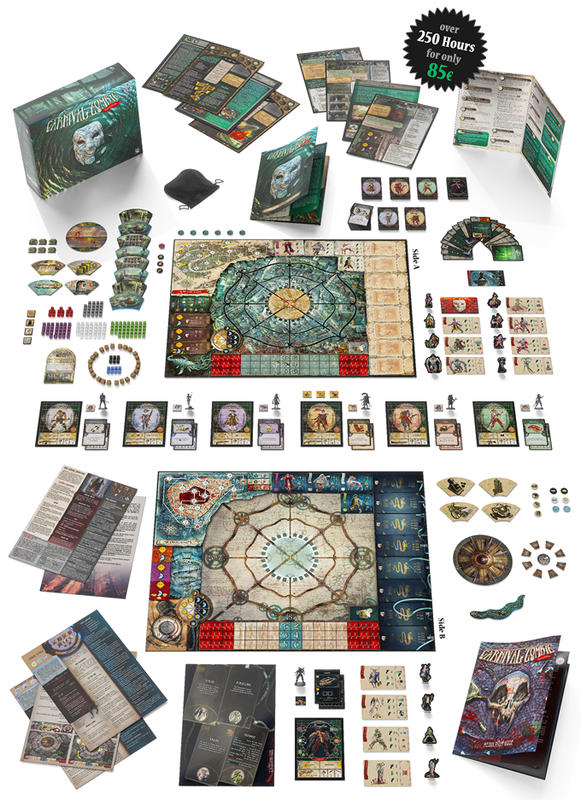 We decided to release a special DELUXE box available only during KICKSTARTER campaign featuring a double sided game board: on one site there will be the classical Carnival Zombie board, on the opposite a brand new city: Mediolanum (Milan)! TW: This is a great news. Can you tell our readers something about it? 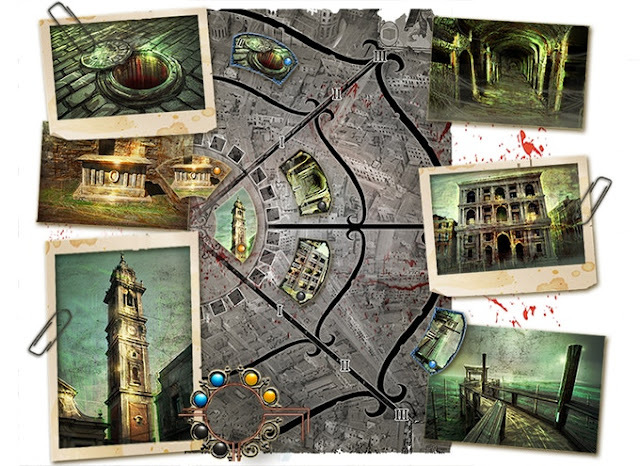 MS: Mediolanum (latin name for Milan) features a brand new campaign with a city to explore and new nightmarish challenges to face! It is set during Milano’s fashion week, following the escape from Venice, when the world discovers that the infected are not only confined to the lagoon but are also awakening in the canals of the newly restored Milan’s navigli canals and swarming overcrowded catwalks of fashion show. Under the city lies Tarantasio, the great serpent. He was defeated in middle ages by the first of the Visconti, the dukes of Milan, who have borne its image on their coat of arms ever since. Although defeated, the great serpent had not been slain. Now it is waking up just like the Leviathan. This time the group of Venetian veterans will face a truly deadly mission: they will have to fight their way into the heart of the city, set off the holy bomb, and flee from the explosion. Will our heroes be able to survive this foolish challenge? - ÜBER-WEAPONS: really huge weapons difficult to discover and hard to use, but really powerful and with a high strategic importance, you will see them..
All of this will be KICKSTARER exclusive and available only during the campaign! TW: So this will be an implemention of Carnival Zombie or are there going to be significant diffrences between these two games? MS: The game structure is basically the same, but the campaigns are completely different. Milan campaign is shorter but even more deadly, you will have to go into the heart of the city finding where to place the holy bomb for killing the great snake and then flee. People playing base game would feel comfortable with the rules, they’re not different, but there is some major cool improvement in that campaign. And finales are completely different. TW: Will there be a way to combine them? MS: Contents would be linked, so you could use Milan’s character in Venice campaign and vice versa, the same for bosses and uber-weapons! TW: Do you have estimated release date? MS: We are aiming at november 2019. I don’t want to fail the deadline: although most is nearly fully developed, unexpected events could cause delay and so it is wise to take time. TW: Who is testing your games? MS: Playtesting is the most time consuming process in game design. And it is more when is game designer doing it because you cannot avoid constantly stopping and reasoning about changes on the run for fix the game. We cannot but test ourselves our games, at least until a very consolidated development: we take care however to always test them with the most different people is possible: we try to involve mostly gamers, but not just them, that depends on the project we’re working on. When we think that the game is ready, we send them to trusted playtesters to test it and give us feedback: they’re usually gamers with different levels of experience that we know by person. TW: How long does it take you to transform the original idea for a game into a actual board game? MS: That depends on the type of game you want to develop. Some may take just some months, others may take years! TW: I always like to ask in my interviews about the story behind the company's name. Why Albe Pavo? MS: As i said, we started designing games in three friends, just for fun. Then Gomez, one of us, suddenly died for a terrible illness. Then me and Jocularis decided to honor him by publishing some of the games that we designed with him and to take to life many more to take alive his memory. Albe Pavo comes from latin, it means “white peacock” and you see it on our logo. We chose this logo because the white peacock is an allegoric symbol of eternal life and that’s exactly what Albe Pavo want to mean for our friend: he will live eternally in our memory! J: That's true, sometimes the force to start up a new experience comes from the loss of a dear friend. That's the flame that keeps Albe Pavo alive, from the beginning. Just this. To Gomez. 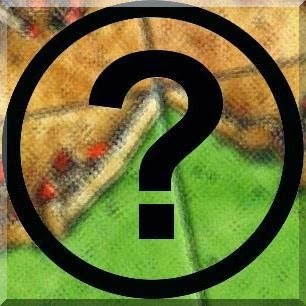 TW: Where can we find news about your new games? Besides on my site of course :-). MS: :-) I suggest people to come in contact with us on Facebook, that’s the easiest way for us to spread news about what we’re doing! TW: Would you like to say something to your fans in Poland? MS and J: We had occasion to work many times with polish fellow and I always felt good with them: we really would like to visit your Country and spend some time with polish people! Oh, and your Zubrowka is great!!!!! TW: Thank you a lot for answering all of my questions. I wish you all the best and good luck with your project!